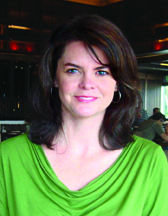 THIRTEEN spoke with Amy Hausmann, Assistant Director of MTA Arts for Transit & Urban Design to learn more about the program and it’s variety of initiatives, from music to poetry to permanent art, and what we can expect from Arts for Transit as the subway continues to expand. Treasures of New York: Art Underground focuses on the MTA’s permanent artwork, but there is a lot more to the Arts for Transit Program. Can you talk about some of the other initiatives? Absolutely! Arts for Transit is charged with enhancing the transit environment for commuters with all kinds of visual and performing art. In addition to the permanent work we commission, we run several programs including the Lightbox Project, where we curate the work of photographers at six different locations around the subway system. The work often touches upon transportation or upon the communities in which the work is installed. 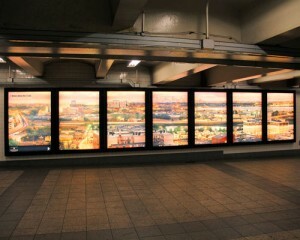 Currently we are presenting work by the artist Jeff Liao, that is a gorgeous panoramic view of the number 7 train as it winds its way through Queens. That’s installed at the Bryant Park, 42nd Street station (B,D,F). We also have an incredible work by photographer Jim Dow, who was actually one of the last photographic assistants for Walker Evans, and his work celebrates diners and really great eating spots around the country. 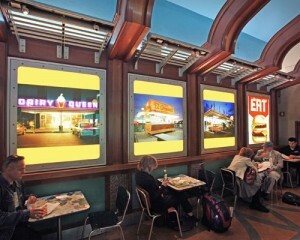 The exhibit is located on the dining concourse at Grand Central Terminal. We administer a poster and art card program, and are able to capture unused advertising space in stations. 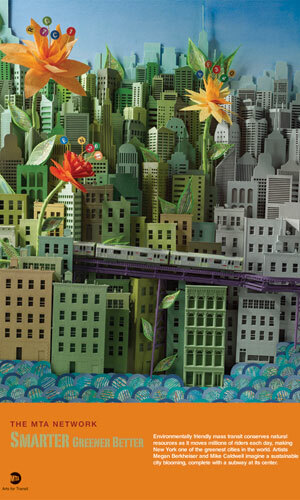 This year, for example, we commissioned a poster by artists Megan Berkheiser and Mike Caldwell that celebrate the sustainability of the Subway system – the fact that 8.5 million people use the Subway every year makes New York one of the greenest cities in the world. In addition, we commission artists to create art cards, which are posted in the Subway cars. This year, the two art cards on display have been really popular. One is by Gregory Christie, and it is a fabulous, neon image of musicians playing in the Subway system. The other is by the artist Sophie Blackall, and she celebrates all of the wonderfully diverse people who travel on the Subway. We originally saw Sophie’s work as part of her ‘Missed Connections’ blog; she illustrates many of these “missed connections” that are found on Craigslist, and we thought her work was charming and really incredible. The public has responded by writing us lots of letters telling us how much they love it and say that seeing the poster reminds them why they live in New York. Our newest program is Poetry in Motion, which we just relaunched in April, which is Poetry Month. Poetry in Motion is a program that was around for a long time, and then it was on hiatus for a couple of years. We’ve brought it back now with a new design concept and we are partnering with the Poetry Society of America to select poems. The design itself actually marries poems with imagery from our permanent art collection. 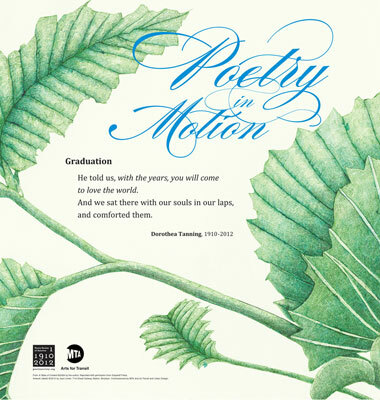 The first Poetry in Motion piece that we issued features artwork by the artist Joan Linder, whose work is newly installed at 71st Street in Brooklyn and it’s combined with a beautiful poem called “Graduation” by the artist and poet Dorothea Tanning, who passed away this January when she was 101 years old. 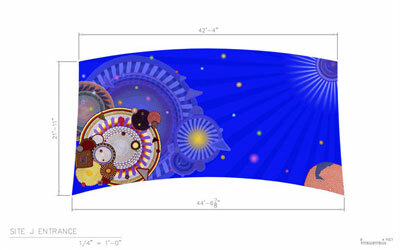 The second piece that we produced had artwork by Elizabeth Murray. It’s a mosaic piece that’s installed in Queens at the 23rd Street and Ely Avenue station (E, G), and it’s joined by a poem by the poet Aracelis Girmay. 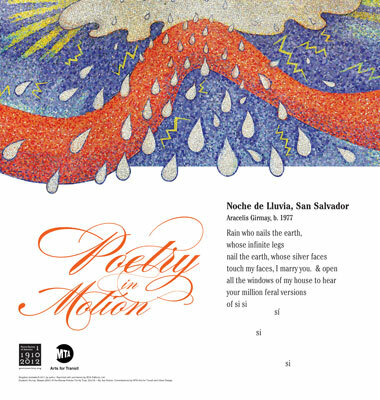 We’ll be publishing eight Poetry in Motion posters and special Metro Cards each year, so keep an eye out for the new ones in the next couple of months. And, then of course we have our music program called Music Under New York, where we present more than 7,000 musical performances in the Subway every year. We hold annual auditions in Grand Central each May. We have over 350 musicians who are part of the program now, and they are scheduled by our office to perform in 26 locations throughout the Subway and Rail system. With Music Under New York, are there certain qualities you’re looking for in a musical act? How do you make the decisions for who gets into the program? We ask musicians to submit their samples to us, and we receive several hundred submissions each year for the auditions. We select about 60—this year I think we had about 72 different performers who came in for an audition. They audition in front of a panel of judges, and the judges are a whole range of people: there are people from the music industry, the MTA, the Stations’ department, and musicians who are in the music program right now. We’re usually listening for three different things. First is the quality of the musicianship; second, we are listening for a variety of musical styles. We have a wide range of different kinds of musicians from Dixieland to Cajun to Opera singers to musical-saw players to Rock and Roll to harpists. It’s a very eclectic mix of music. And last, we’re listening for something which is a little more subjective, which is this concept of having something that’s appropriate for the Subway environment. And when people ask about that, I say sometimes we get an incredible marching band or large choral group that might come in, and they’re really amazing, but they’re not quite right to perform in the Subway itself. Yes, probably not quite the right thing. But we have had some great bands and musicians who have auditioned. The musicians are not paid, they play for tips—so we also encourage people to throw a couple of bucks in their hat to say “thank you” for the generous gift they give to the city. “Music Under New York” from THIRTEEN’s New York Voices, Produced by Matthew G. Kells (2008). Note: Some users may need to upgrade to the latest version of Flash Player to view this video. So is Arts for Transit going to have any involvement in the hotly-anticipated 2nd Avenue Subway? We are very excited about the 2nd Avenue Subway. We selected three artists so far for 3 of the 4 stations that will first be completed. 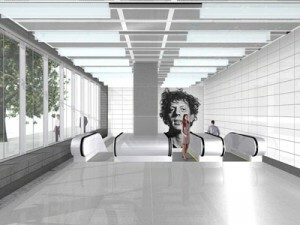 We are going to be working with the artists Sarah Sze, Chuck Close, and Jean Shin and we’re in the process right now of selecting an artist for the fourth station, which will be the 72nd Street Station. We’re truly thrilled about those new projects. We’re also working on some other projects. 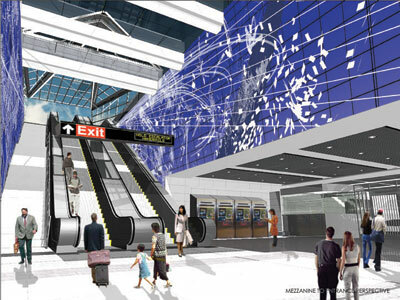 We’re building a new station on the number 7 line, which is being continued over to the West Side of Manhattan. 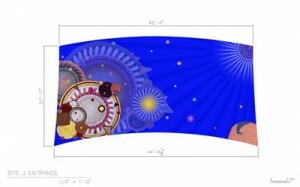 An incredible artist named Xenobia Bailey has been selected to create a gorgeous mosaic work that will be incorporated into that new station. We have another project in Harlem at the Mother Clara Hale Bus Depot. We’ve commissioned artist Shinique Smith to create a large-scale mosaic installation that is going to be absolutely spectacular, and we’re very excited about that, too.